I've got a couple of manis to show you using water decals from Lady Queen. There are 24 decals in the pack of blue flowers & butterflies. The first mani is over a pink base (Nails Inc InStyle Power Pink) and teamed up with stamping using Bundle Monster plate 307. The second mani is using six of the decals per hand (one on each nail with 2 on the thumb) over a neutral base (Nails Inc Providence Court). So whether you want to use the decals on all your nails or just as an accent there are plenty for at least 2 manis. 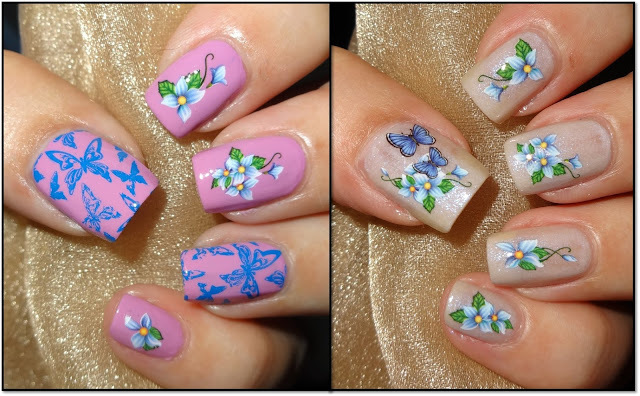 The Blue Flower & Butterfly Water Decals currently cost $1.99 / £1.30 / €1.59. You can also use my 15% discount code AELC15 which gets you 15% off full priced items!